This week, join the guys as they do their best to get “there,” whatever “there” means. Gomer1 re-inserts himself back into the training schedule, and Gomer2 heads to warmer climates for some recovery training, which includes catching a glimpse of the weirdest person he’s ever seen while on a run. 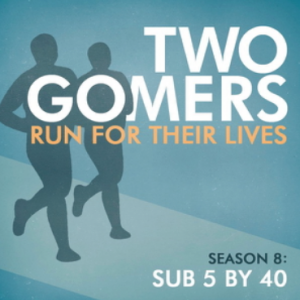 Also, some classic half-marathon memories, a valiant but unsuccessful attempt by one Gomer to get the other Gomer to confess something, and the final Marriage Ref review ever on the podcast (Lord willing). Stick to your day job, dudes. Plus what you always expect: Week in Review, Listener Feedback, Gomer’s Tips, two more Tips from a Ten-Time Marathoner in the Runner’s Corner, and two new (embarrassing but true) Songs To Run To. Happy Running! It’s a shoe-centric Monday Survey this week: what’s your prefered brand of running shoe? Are you a loyalist when it comes to shoes? Fess up, Gomer1 – we want to know your embarrassing song to run to! As for running shoe brands, right now I run in Brooks, but I want to switch to Nike (sorry, Gomer2) because I like the Nike+ thingy for the iPod. Just listened to the Gomer2’s tip of decreasing the drama. That was me that asked how much drama can happen to Two Gomers. I totally agree with Stephen about not watching Parenthood in order to decrease the drama. I do have plenty of drama in my own life. Hearing about other people’s real life drama doesn’t bother me, but for some reason watching a TV show that has continued drama such as Parenthood is hard to enjoy. I much prefer a movie or even older 30-minute sit-coms (Cosby Show, anyone?) that may have some drama, but when the movie or show is over, so is the drama. I’m thinking I heard a tease of the confession song to run to, brief, subtle and talked over, but there was something there… I won’t spoil it, but let others see if they heard it. You are not alone Anthony. I have quite a few songs that would be harder to admit to listening to while running. Perhaps that should be a survey question sometime: Embarrassing songs to run to (eS2R2). Brooks all the way! Each shoe company uses a standard last to start from so depending on your foot, one brand probably makes a shoe best for your foot….Brooks Adrenalines are the best for my foot even though I’m no longer a pronator, they are so choice. Suggested reading: “Born to Run” It’ll make you think and it’s a great running purist book…. If you do decide to change shoes, choose carefully, especially for marathon training….pay attention to your feet and don’t be afraid to take them back if they aren’t your shoe…..
Love the show you guys are a blast keep up the hard work and all the training. Next time you are in Tucson shoot me a Email dsalzer@comcast.net love to run with ya! I live here in Tucson just set a PR this last weekend at the AZ Oro Vally Half Marathon great race. Ran my 1st Marathon this past Dec. The Tucson Marathon it was good time maybe will see you at that race this year? Keep rocken the podcast guys. I can’t believe you have “The Climb” on your playlist! Now I can abmit it too! To add to the “gomerness”, I have it on both of my playlists and it is my midway song (ie it’s what gets me over the hump). Hanna Montana aside, the message is in line with what you guys are doing: Its not about how fast you get there; its not about what’s waiting on the other siiiiiiiiiiiiide; it’s the climb! Years ago when I was a pre-pre gomer I was started on Saucony GRID for stability by a local running store. Then several years ago as a pre-gomer it was suggested that I try Brooks RADIUS shoes by a local running store. SooooWEEET! The only kind I buy now. And as a Gomer Gomer … I hope to get some use out of them 😉 Not that Saucony aren’t good … they are. But for every foot there is a good…better…best phenomenom you have to wade through. Hence the guy you mentioned in the PodCast about the same brand/model for twenty years. I have heard of some runners who literally FREAK when they discover their beloved shoe has been discontinued by the manufacturer. Forget the brand and go for what keeps your foot happiest…and pray they don’t get discontinued!! Happy Running!! @ Matt I thought I heard a teaser too, but wasn’t it a Celine Dion song as well? Asics are my shoe of choice right now. Do you dudes have an e-mail account we can write to? I have a message that may be a bit long for this reply thread. Song to run to: “Coronation” from the Stardust score. Very regal.